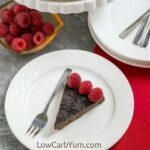 A dense flourless cake for those following a low carb keto diet. It's a simple chocolate dessert that only requires five common ingredients. Unauthorized use and/or duplication of this material without written permission from site owner Lisa MarcAurele is strictly prohibited.